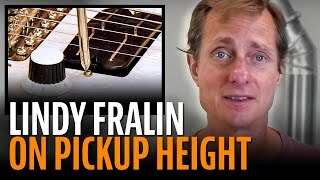 Lindy Fralin, of Lindy Fralin Pickups, shows how he sets pickup heights. Lindy shows it's not about measuring, it's about listening. Recorded at last summer's Northwoods Seminar in Michigan. 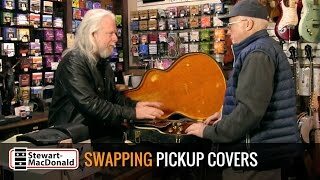 Erick Coleman has a 50-year-old pickup that's nearly dead: It's making a little bit of sound, but not much. 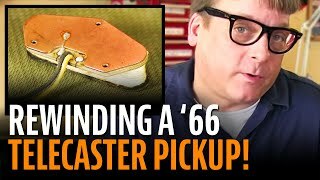 Erick opens it up to find the trouble, and we get a good view of the guts of this vintage Fender pickup before he rewinds it. Don't ruin your pickup rings by skipping this step! Dan Erlewine nibbles, files, scrapes and sands to create a curve that matches the top of his Les Paul. Trade Secrets On The Road: Dan Erlewine visits the repair shop at Herb David Guitar Studio in Ann Arbor, Michigan. He brings back this great, simple tone tip from repairman Brian Delaney. After 55 years, the original owner sells a 1957 Gibson Les Paul Junior because the pickup's dead. Erick Coleman tells the story of bringing that pickup back to life. None of your beeswax? Potting pickups with paraffin. Erick Coleman answers a frequently-asked question: how (and why) to wax-pot a pickup. "I wired this guitar, but it didn't work. Can you fix it?" Dan Erlewine wants to install two very different pickups in a jazz guitar. When there's no place to fit active system's battery he comes up with a simple, flexible solution. In our Money Talk series about operating a repair business, Dan Erlewine tallies up the time and expenses of a profitable pickup installation job. Erick Coleman gets an urgent call on a Friday night: the Heavy Metal band Skeletonwitch needs some custom pickup work in time to head to Ozzfest in 24 hours! It's a crime to cut pickup leads this short! Erick Coleman has been rooting around in the parts drawers at Dan Erlewine's shop, and he's found a 1960s Gibson patent-sticker humbucker. It would be valuable if somebody hadn't cut off the pickup lead. Erick shows how to fix that. The multimeter tells Erick Coleman that this pickup is dead, but nobody told the pickup: it's still playing! Erick Coleman's used pickup sounds great, but a broken baseplate makes it useless unless this bobbin transplant works. Erick Coleman shows how to rewind a vintage singlecoil in a 1959 Strat. Erick Coleman clears up the confusion about acoustic pickups: separating them into different types and helping you figure out what's what. Dan Erlewine's upgrading an inexpensive guitar with replacement pickups. The job's got to be done quickly at a low price, so he demonstrates some time-saving tips. 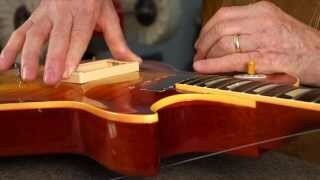 Fixing an acoustic pickup fast—it has to be onstage in an hour! Dan Erlewine does some emergency surgery on an undersaddle transducer in time for it to make it on stage with Emmylou Harris. Erick Coleman needed a pickup like a good old Gibson P-90, but sized to fit a 3-string cigar box guitar! Here's how he built it, and how you can build yourself a custom pickup for any instrument. 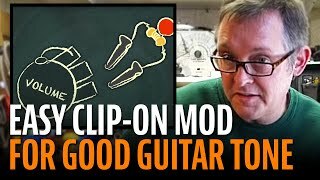 In this week's newsletter, bad sound from a good acoustic guitar pickup: the problem and the solution.